They say that every year our population reaches a staggering percentage of obesity. Our electronics, media, eating habits, and workplaces contribute to a relatively sedentary manner of living. More and more people incorporate less and less movement into their daily lives. However, this does not describe everyone. There are many individuals who remain active, who are involved in sports, and who regularly exercise. Today, much of our medical attention is devoted to those who fit the first description; but in many ways those who are continually active are prone to other types of sprains and injuries. Thankfully, there are those who also specialize in sports medicine who focus specifically on providing medical solutions to those more active injuries who what to prevent injury or who suffer from one due to their involvement in a kinesthetic activity. You can become one of these cherished individuals when you earn your Associate's Degree in sports medicine, learning the skills and methods for helping athletes and other active individuals to stay moving. Sports medicine is roughly broken down into three different areas of services to active individuals: guidance, prevention, and rehabilitation. To effectively provide appropriate services to these athletes, an Associate's Degree equips students with a broad range of knowledge. Like many other areas of medicine, sports medicine requires a specified expertise to deal with the unique medical conditions that arise. Students pursuing a degree in sports medicine will commonly study kinesiology, health and exercise science, physiology, first aid, nutrition, therapy, sports psychology, and weight training techniques. Other certifications, like first aid and CPR, are frequently included. These courses provided the basis on which a student receives well-rounded sports medicine preparation. One of the largest advantages about an education in sports medicine is that the diverse training it offers in many fields makes a student qualified for a number of careers. Some of the most frequent applications of this degree are becoming a personal trainer or fitness instructor. Here, you provide clients with personal instruction on their health and fitness habits. This includes how to work out, what exercises to focus on, what goals to set, and what nutrition habits to establish. This is often done on a one-on-one basis, although often a fitness instructor can work with larger groups or classes. Employment is often provided inside of a public or private gym, or trainers might even be invited to clients' homes to work with them in a more personal setting. 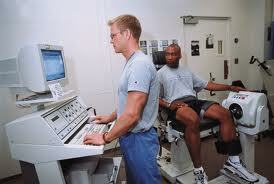 Other applications of an Associate's Degree in sports medicine also include coaching. Many junior high, high schools, and colleges require coaches who are not only experts in a sport but experts in athletic health. Serving as a head coach, an assistant coach, or a team's athletic trainer are common areas of employment. Sports medicine is also an important element inside of the classroom, and many physical education teachers and health teachers begin with a background in sports medicine. Students of all kinds not just athletes learn about how to treat and train their bodies for healthy living, all based on the expert knowledge you pass on to them. So while there are many, many individuals in our society who are tipping the scales towards obesity, there are still many, many others who require a talented and knowledgeable expert to help them maximize their health and athletic ability. With an Associate's Degree in sports medicine, you will be able to enter the exciting world of strong, toned, fast bodies, keeping athletes fit by providing them with preventative and rehabilitative care. Whether working with athletes as a coach on the field, an educator in the classroom, a trainer in a gym, or in any of the other diverse areas, sports medicine is a rewarding career. Depending on the education level you end up with after graduation you’ll have the necessary experience to look into the below careers. Additional training could be needed depending on your specialty. Athletic Trainers – As an athletic trainer you’ll come up with strengthening drills and track the progress of those who you train. Athletic trainers can be part of a team or often independently contracted to handle certain parts of a sports program training regiment. Physical Therapy – As a therapist you’ll help those who were injured playing sports and design a recovery plan to improve their health and mobility. Often physical therapy assistants work in hospitals or doctor’s offices but can be part of a sports team at the college or professional level. Sports Nutritionist – Want to help others with the proper diet and supplements improve their game? Athletes need not only the proper training but the proper diet and nutrition in order to be successful. Every athlete is different in what they need to consume each day and you’ll be tasked with creating and monitoring these plans. Sports Coach – We often see individuals who go into sports medicine who want to become a coach. This is very common as they have a passion for coaching and perhaps were once even a player in high school or college.